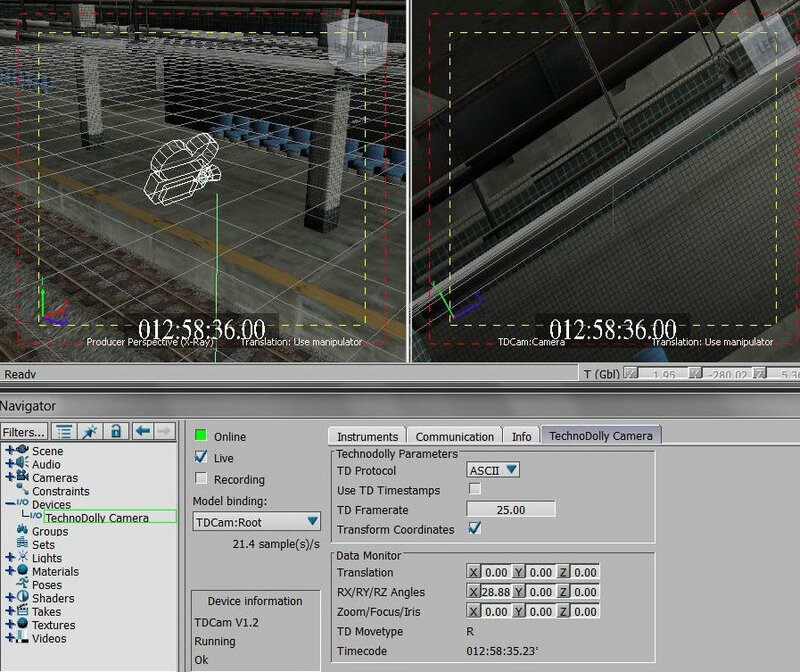 TDCam connects camera tracking data delivered in real-time from the camera crane to AUTODESK MotionBuilder in order to support real-time previs. Camera position, orientation and zoom/focus/iris encoder values are delived to the MotionBuilder PC via serial connection and used to control a virtual camera in the realtime render engine of MotionBuilder. Virtual sets created by generic modelling tools such as AUTODESK Maya or 3D Studio Max can be merged with the live camera data by converting the sets to Autodesk FBX and importing them in MotionBuilder. 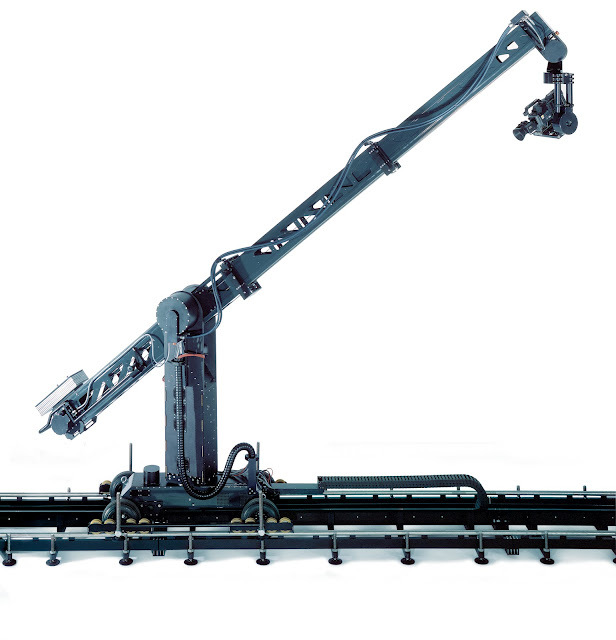 I do not longer develop and support Autodesk MOTIONBUILDER plugins for cranes of Technocrane. I had to close this development branch in 2016. Please contact Technocrane to obtain a reversed engineered and/or updated TDCAM plugin for Autodesk MOTIONBUILDER. Thank you for all the support from 2010 until 2016. I really enjoyed working with you and the Technocrane team. Timecoded data may not placed at the correct time position on the transport timeline if "Use TD Timecode" has been switched on and the time code mode and gen lock setting in Mobu is set inconsistantly. Call us in case you encounter problems --- it is far from trivial to get this right, so do not hesitate to call me (+4915759258236). If this not an option, use this work around: Set "Use TD Timecode" to off , select "Software Timestamp" instead of "Hardware timestamp" and set the TD Framerate to a multitude of the correct frame rate (e.g. 96 fps in case you shoot with 24fps): The data is placed on the mobu timeline based on the arrival time at Mobu. Nevertheless, if the timecode is delivered from the Technodolly, each key contains the TD timecode as a aditional "tc" time property to support offline re-position of the keys correctly on the timeline after recording. Timecode reader functionality of tdcam to provide an additional real-time timecode in Mobu named "TD Timecode" may not aligned with the data packages and the reference sync if non-pal frequencies are used and the render setting does not match the sampling date Technodolly send the data. Ensure that the sync info setting and time code mode in MotionBuilder is always consistant, e.g. use for cinema 23.976fps, timecode 0-23 frames with 1/23.976s interval, genlock 23.976 OR use in PAL envioment 50Hz field update/25 Hz fullframe, 1080P25Hz, 25fps timcode 0-24 frames with 1/25s interval. Call me if you have encounter problems. Sync count shows sync erros in HUD (press shift f in viewer to display it). Mobu 2014 crashes if sync info is switched on. In case you use the PNY SDI Option card to produce HD-SDI out within MotionBuilder: I faced some problems if you use two monitors and the SDI Option card. I recommend to connect only one monitor to the workstation during previs. The software TDCAM for Mobu 2010 - 2016 under MS Windows 7/8 or Linux 64bit (RHEL/Centos 6.5) is available free of charge but without any warranty or liability. It can and has been used during production. TDCAM packages are still free of charge but you must send us a request email with a valid return adress to obtain the download link and the password for the plugins. You must also agree to be informed about updates of tdcam in the future. However, you may unregister any time by notifying us accordingly via email. Best-Practice added to manual: "Do not connect the serial cable from the Technodolly to the Mobu workstation BEFORE Windows is up and running properly. Otherwise the COM port might not be usable by TDCam ("open error"). If this happens, reboot without the serial cable plugged in and try again." Support for Mobu 2016 Win7/8 64-Bit has been added to the installer. TDCAM for Mobu 2015 and Mobu 2016 bundled with the all free TDCAM versions has beta status, shall not be used in production and will stop to operate after 2015-06-31. Check it out and tell us your experience, e.g. investigate the new realtime Depth of Field feature of Mobu 2015 onwards. Added Rapid Save & Restore to be able to save tdcam settings without fbx scene overhead. This feature is limited to Mobu 2013-2015 only. Restores now also Rotation and Translation offsets configured on the first tab in device settings. Removed all restrictions for TDCam for Mobu 2014. Can be and has already been used in production. Add missing sections to manual concering new sample modus setting, rapid save/restore and advanced timing. TDCAM for Mobu 2015 bundled with the all free TDCAM versions has beta status, shall not be used in production and will stop to operate after 2015-04-31. Check it out and tell us your experience, e.g. investigate the new realtime Depth of Field feature of Mobu 2015. Added Rapid Save & Restore Modus to be able to save tdcam settings without fbx scene overhead. This feature is limited to Mobu 2013- only. Fixed some bugs preventing plugin to save and restore in FBX properly. Added new Sample Modus configuration to have complete control over the way TDCAM hands timing. Removed Popup message for evaluation license status of TDCam for Mobu 2014. Within a few days all restrictions will be removed. Increased robustness in case the device is used in the story modus. Note, Mobu 2014 SP1 fixes a bug also in Mobu concerning the story modus. Added advanced timing section to improve remote trouble shooting: A small amount of the cgi data stream arriving at the Mobu workstation is timestamped, buffered in Mobu and the jitter is computed. The data can also be saved to a file for further analysis. The evaluation license period of TDCam used for the versions dveloped for MotionBuilder 2014 & 2015 has been extended until 2015-02-31. Contact me or Technocrane in case you want to use it for production. Automatic Take Recording should 'record' in Mobu if and only if the user has selected the device for recording. If not, Automatic Take Recording should simulate 'play' instead of 'play & record' . This new behavior can be used during testing and reheasal to start all user-defined animation on Mobu in sync with starting a Technodolly preprogrammed move. Automatic Take Recording is named Autoplay Trigger now. The automatical deactivation of the Autoplay can now be switched off . Support for the TechnoDolly "Camera On" flag. If the Technodolly is connected to a timecode source, incoming data is automatically time stamped with the timecode. The live Technodolly input stream acts in AUTODESK MotionBuilder as a normal Timecode source and can be displayed in the Head-Up-Display (HUD). Automatic take recording starts playing any userdefined animation sequence in combination with the live virtual camera feed as soon as the Technodolly operator starts a pre-programmed move. The merged animation sequence is recorded to a new take in MotionBuilder automatically. Automatic take recording is deactivated as soon as a take has been recorded successfully. This prevents tdcam to create a new take in MotionBuilder if the technodolly operator simply plays the move backwards to position the crane back to the start position. Please send us bug reports and requests for new features and improvements via email to tdcam<remove_this_please>@ecke<removeaswell>svision.com. Custom import of raw CGI data with advanced converter options useful for experienced users who want to deviate from the standard converter setting on the TechnoDolly desk. Visual feedback of the Technodolly targeting features by adding a reference marker to the position in the scene each time the techndolly is locked to a target. Introduce experimental TDSim device output plugin for Autodesk MotionBuilder to simulate a technodolly camera in MotionBuilder able to stream out live camera tracking data in the Tecnocrane binary format as the real technodolly might do it on set (for evaluation/test purposes or motion planning). Maybe TDSim might also use constraints to ensure that the dynamical limits of the crane cannot not violated. This avoids impossible moves during motion authoring as early as possible in the production workflow. Would you like us to add an item to this list for the next release ? Send us an email ! You need a valid AUTODESK MotionBuilder license installed under Microsoft Windows 7 (32 or 64 bit) workstation or laptop and a TechnoDolly camera crane to benefit from the TDCam plugin. Connect the TechnoDolly serial port with a serial port of the MotionBuilder PC or use a Serial-USB-Converter on the PC/Laptop side in order to make the camera tracking data computed at the TechnoDolly camera crane available in AUTODESK MotionBuilder. Click on the image to see the full screenshot. Autodesk, the Autodesk logo, and MotionBuilder are registered trademarks of Autodesk, Inc.